Use MeterMall’s P200 Replacement Borozin Powder Bottle to create puffs of dense white powder for checking flow patterns of low-velocity air. Great for clean rooms, safety hoods, hospital isolation rooms, checking wind direction, air movement through vents, K9 scent training, and more. Contains ultra-fine, aerodynamic Borozin Powder (Zinc Stearate) having high visibility, great hang time and virtually no residue. Eco-friendly, non-toxic, odorless, noncorrosive. Unlike other forms of air-tracer smoke, Powder Cloud will not set off smoke detectors! One bottle creates hundreds of puffs. Bottles are not refillable. Reorder when empty. Purchase the P200 as a 4-pack (P200-4) and save 10%! Please Note: The P200 Replacement Powder bottle requires the P100 Powder Cloud rubber squeeze bulb to create a complete system. 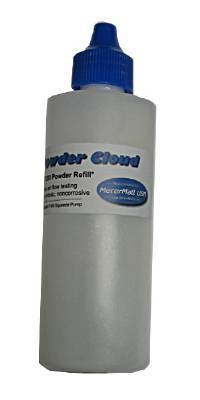 Order P100 Powder Cloud system below.